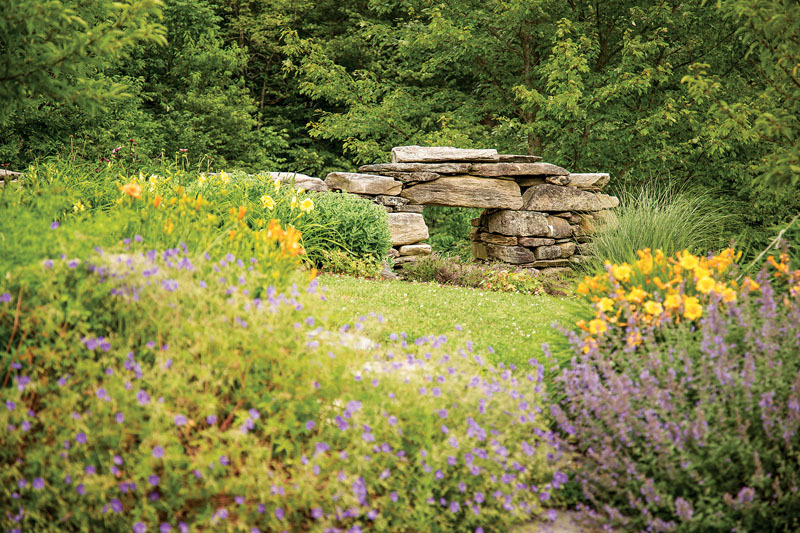 With our Home Outside service, JMMDS can create landscape plans for people who live far from our Vermont studio. How can we create a landscape design without visiting your site? Our online process allows homeowners to send us information about their property and preferences right from their desktop. If you have a property plan or survey, you can send it to us, but if not, you can use the Home Outside app to import a satellite image of your property, or draw it yourself. Many people are able to capture their property using the app’s Map Tool, which imports a map image into the design. If the image of your property is inaccurate or hard to see in the Map Tool’s satellite view, you can draw your own base plan. Here, we’ll show you how. Mapping your site is easier than it sounds. The image below illustrates the measurements you’ll need to take in order to create a complete, accurate base plan. You’ll need: a measuring tape (at least 25′ long), graph paper, a pencil/eraser, and, ideally, a partner (to hold the end of the tape and shout dimensions while you draw the plan). Scale: Choose a scale that will allow you to draw your entire site on one sheet of graph paper. Depending on the size of your graph and your property, one square may equal two feet, 10 feet, etc. In the following drawings, one graph square equals five feet. Measure the perimeter of your property or design area and transfer it to the graph paper. Use your tape measure several times, or measure the length of your stride and pace it off. If you take 50 strides, multiply that by the length of your stride (for example, 3′) and mark it as the distance (150′). After determining the scale, measure and draw your property outline on graph paper. Starting in the lower left corner of your property, measure the distance from the property edges to the nearest corner of your house (try to keep your tape perpendicular to the property edge). Locate your house on your property plan. Working clockwise from that lower left corner of your house, measure the dimensions of each side of your house as shown in the diagram below. Include porches, decks, and attached terraces. As you move around your house, remember to include steps, doors, and first-floor windows. If you have a larger property and your house, to scale, appears too small to notate on your property plan legibly, then use another sheet of graph paper to make a larger drawing of your house details. Once you have the outline of your house, go back to your overall property plan and draw the basic outline to scale on your property plan. Measure and draw your house to scale on your property plan. Label the general locations of your first-floor rooms and doors to help the designer understand the flow between the house and landscape. Label first-floor rooms and doors. Although ideally your entire plan fits on one piece of paper, if it becomes difficult to read you may want to use a separate piece of paper for the last few steps. Add significant elements to your plan by measuring their distance from the house. Include elements such as paths (you might also want to note the paths that people tend to traffic even if there are not actual pathways! ), planting beds, water elements, driveway/parking, walls, and fences. Also note utilities such as HVAC units, spigots, well pumps, fuel tanks, etc. Indicate all major landscape elements on the property plan. You don’t have to indicate every single tree, but take the time to locate the largest trees and those most important to you. You want them located correctly because it’s likely they will guide the layout of your landscape. To locate your trees accurately, take measurements from the trunk to two different corners of your house as shown below. Place trees on your property plan accurately by measuring their distance to two different points on your house. Now you have a solid base plan of your property, an invaluable starting point for a landscape design. Take a photo of it with your phone or tablet and make it the background in a new design using the Home Outside app. Whether you design it yourself with our app or with the help of the Home Outside landscape design experts, you’re on your way to making your own Home Outside!